The Kia Optima PHEV is NOT equipped for Crocodile Transport. The Kia Optima is not only our favorite Kia model, but it’s also our favorite mid-sized sedan. That is why we were so sad when Kia picked up our long term loaner Optima back in May, as we had become quite attached to it. However now a more fuel efficient Optima has arrived in dealerships, which gave us an opportunity to get behind the wheel once again. 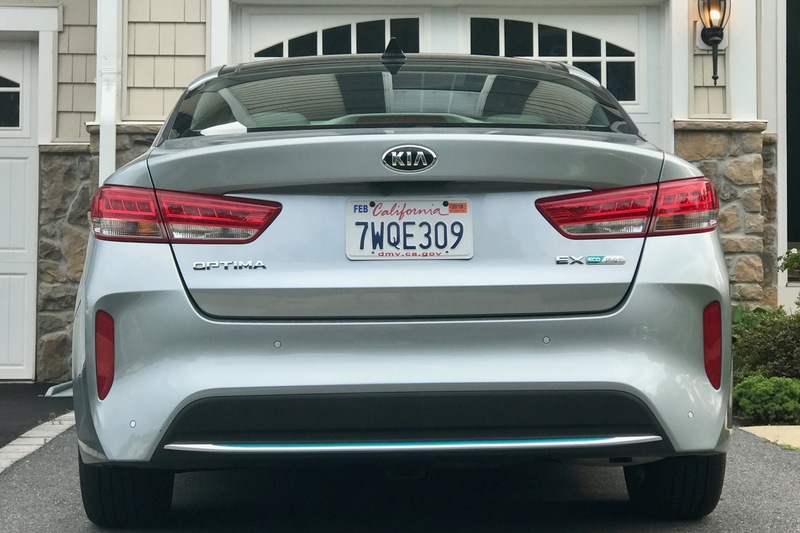 Back in June we published our first-drive review of the 2017 Kia Optima Plug-in Hybrid (PHEV), by a writer who had not previously driven a Kia. 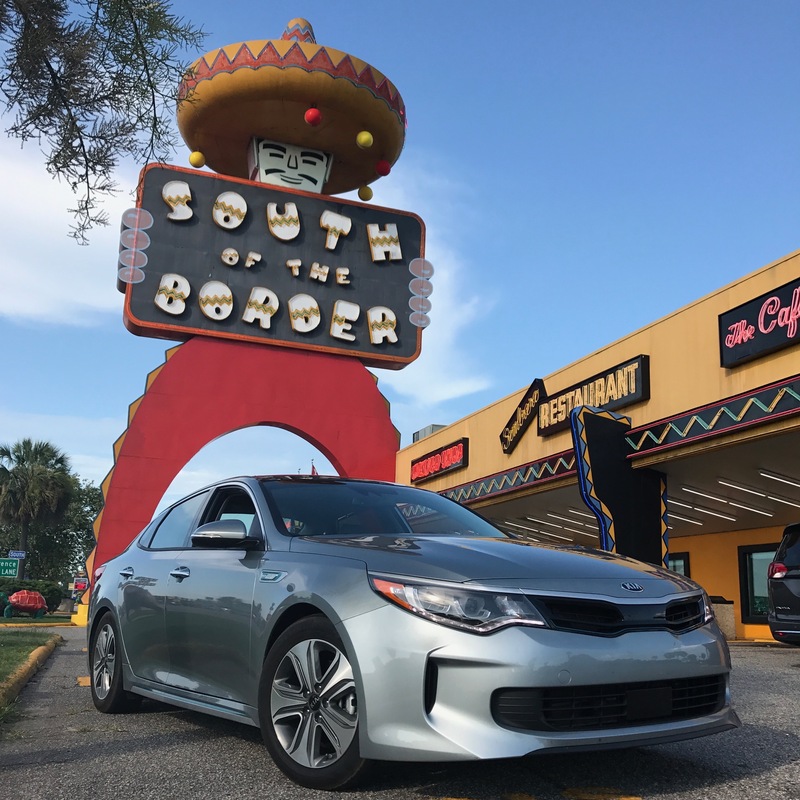 Today we’re back with a new feature, after an epic 1800 mile road trip to St. Augustine, Florida and back in the Optima PHEV. Gasoline AND Electric? What sorcery is this? As you can see above, we started our road trip with a gasoline range of 524 miles, electric range of 27 miles, for a total range of 551 miles. So if we wanted to drive all the way to Florida without using gas, we were going to need to stop to charge. At every exit. 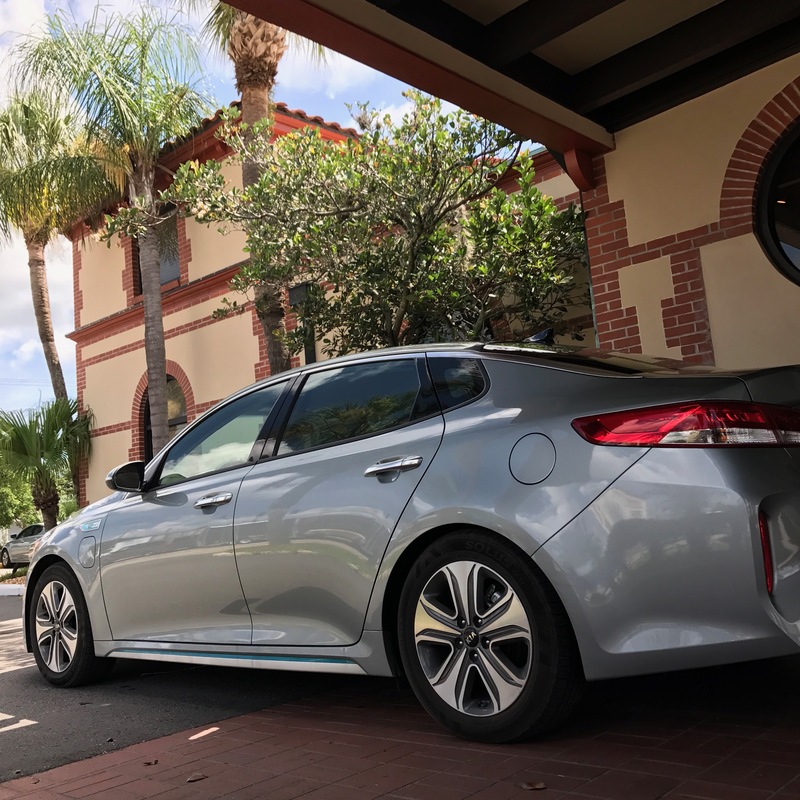 The reality is that a Plug-in Hybrid is practically reduced to just a Hybrid (HEV) during long road trips, but the Optima’s plug-in capability (with 9.8 kWh lithium-ion polymer battery pack) is great for short trips around town when operated in all-electric mode (EV). It really is the best of both worlds, offering the range of gasoline, the efficiency of a hybrid, and the possibility of going all-electric in the right situation. So although we charged up the night before hitting the road, our primary power source for this trip would be gasoline. Before we began our trip, we photographed some of the exterior differences on the Optima PHEV that you can see above. They include aerodynamic alloy wheels, beveled rear bumper, rear diffuser designed to streamline airflow by shrouding the exhaust tip, charging port on the driver’s side front fender, light blue exterior accents, and ‘Eco Plug­In’ badging. In addition, the front grille (seen below) is active, automatically opening and closing at high and low speeds to improve aerodynamics while optimizing engine bay cooling. Everybody look at me cause I’m sailing on a boat. Wait, what? Soon we were on the road for Florida with intentions of seeing just how efficient the Optima PHEV could be. Kia’s Coasting Guide helps coach drivers when to coast and brake via an icon on the instrument panel, and it didn’t take long for us to figure out what type of driving was more efficient. Kia’s Advanced Smart Cruise Control is your best friend on road trips, adjusting the speed of the Optima to match that of the vehicle in front of it, and maintaining a safe distance when traffic slows. It not only makes driving on the highway much easier on your legs, but also helps the Optima to operate efficiently as well. Below you can see we had it set to 75 MPH, with a gap of 4 dashes, which we believe corresponds to 4 seconds. That means the distance maintained varies depending on your speed, as it should. We swear the Speed Limit was 75. If you do the math from one of the previous photos, you can see that in our first 88 miles of our road trip, we were averaging a tasty 43.6 miles per gallon. The Optima PHEV is rated at 38 MPG City, 43 MPG Highway, and 40 MPG combined. So we’ve confirmed that without too much effort, you can easily achieve those numbers. In fact if you check the next photo, you can see that we actually peaked at 44 MPG a few minutes later. Above is one of the ECO Driving screens available on the Optima PHEV’s touchscreen, which shows Fuel Economy over the past 30 minutes of driving. It includes a combination of both Hybrid Fuel Economy and Electric Motor Use, and as you can see, earlier in our trip we were utilizing the battery more, likely as we sat in Washington, DC traffic. We’re not entirely clear if that 44 MPG includes the electric motor use, however we did notice our fuel economy going down later in the trip. Of note is the fact that we switched often between EV mode and HEV mode, and that even when the Optima is in EV mode, it seems to seamlessly use the gasoline engine automatically when needed. Caulk the Optima, Take a Ferry, or Wait for Conditions to Improve? The photo from the Navigation System above shows that the Optima PHEV is even capable of crossing large bodies of water without a bridge. 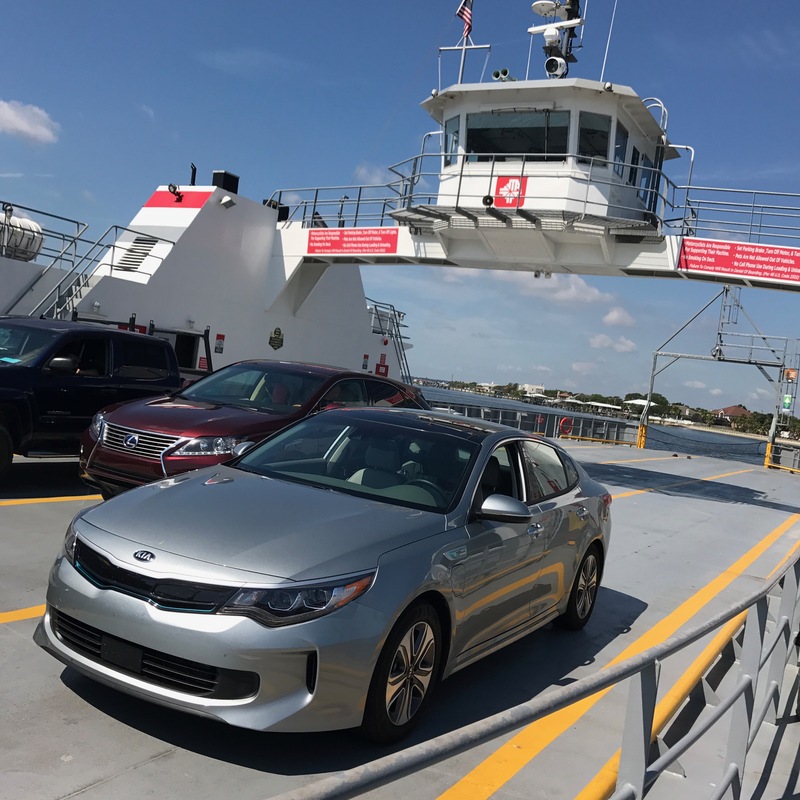 Obviously we took the Optima PHEV on a short boat ride near Jacksonville, but this isn’t the first time this Optima has ridden on a boat. 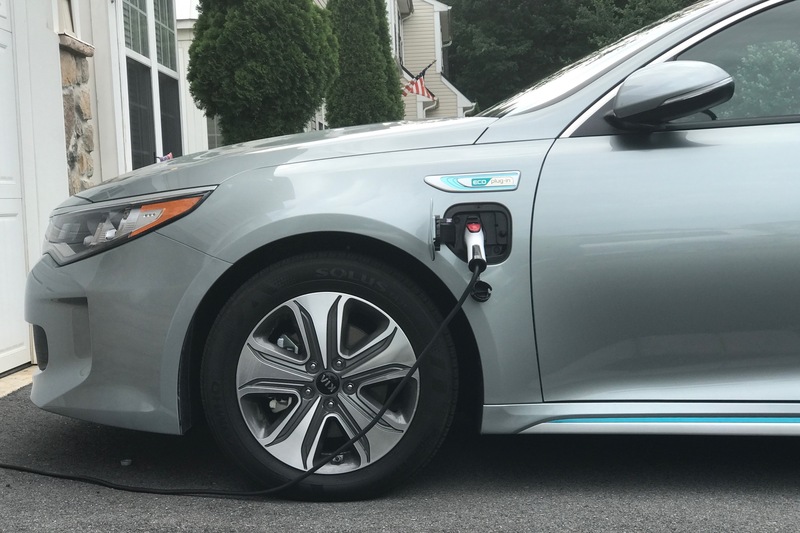 While most Kia Optimas in the United States are built in Georgia, the Plug-in Hybrid is built at Kia’s plant in South Korea. See a photo from the Ferry ride below, along with some other shots from our Road Trip. From left to right; Amelia Island, St. John’s River / Mayport Ferry, South of the Border, and Jaybird’s Inn in St. Augustine. As we mentioned, our fuel economy went down later in the trip. This was partially due to the fact that we didn’t plug-in to recharge the battery during the trip, but also because it was a long drive and we grew a bit impatient with driving at lower speeds. 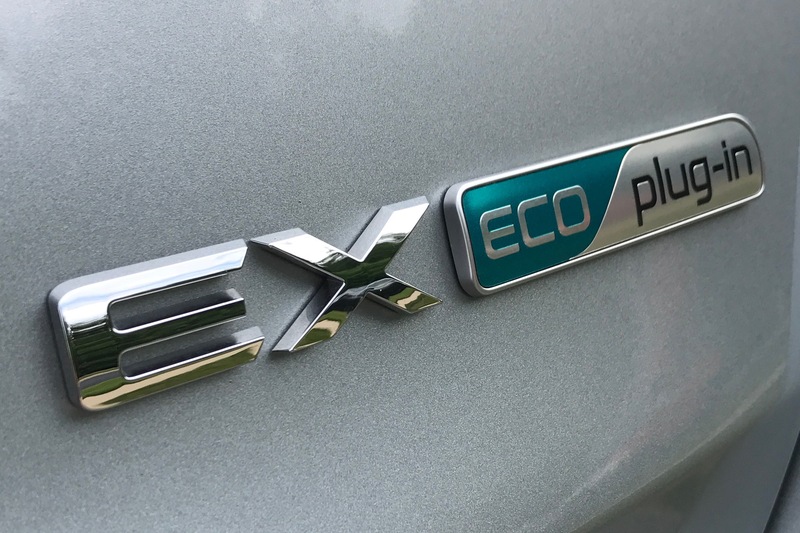 The ECO Driving History panel below keeps track of your fuel economy each time you shutdown the Optima PHEV, which is great for drivers who like to track such things. We don’t have the patience to Hypermile all day. After 1800 awesome miles behind the wheel of the Optima PHEV, we pulled up to the house after midnight on the last day of our Road Trip with only 4 miles of range left on the battery. In the photo below you can see the EV Range mapped out, so that drivers can see an estimate of how far the Optima PHEV will take them in EV mode. Of course the radius would be much larger if we took this photo with the full 27 mile charge on the battery. Please don’t use this map to find our house. The image below shows local charging stations. While we didn’t charge during our trip, we could have used this interface to locate charging stations throughout our trip. This would have allowed us to utilize EV mode for all of our sight-seeing driving while visiting St. Augustine. To be honest, we didn’t find this screen until we returned home, or else we probably would have done just that. 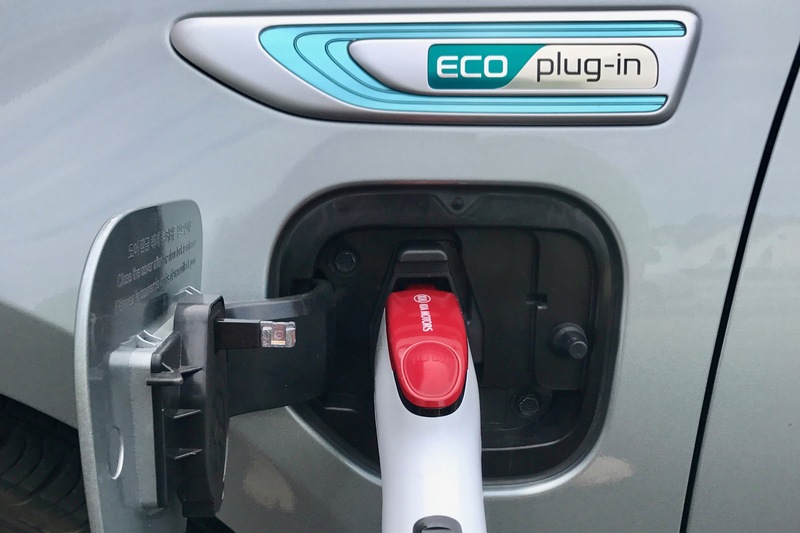 A full charge can be achieved in less­ than three hours via a 240V (Level 2) charger, and less ­than nine hours via a 120V (Level 1) charger. Maryland is flush with charging stations! The comfortable adjustable seats on the Optima. The modern technology and infotainment suite, which includes Satellite Radio, Apple CarPlay, Bluetooth Phone, Harman/Kardon Premium Sound, and Navigation. Advanced Smart Cruise Control and the other driver assistance technologies (Blind Spot Detection, Lane Departure Warning System, and Front Collision Warning System). Hybrid Fuel Economy which allowed us to make the long trip for less than $100 in gasoline. We have a new favorite Kia, and it’s the plug-in hybrid version of the hot-selling Optima. The 2017 Kia Optima Plug-in Hybrid is now available in dealerships, and is priced at just over $40k as tested on our road trip. 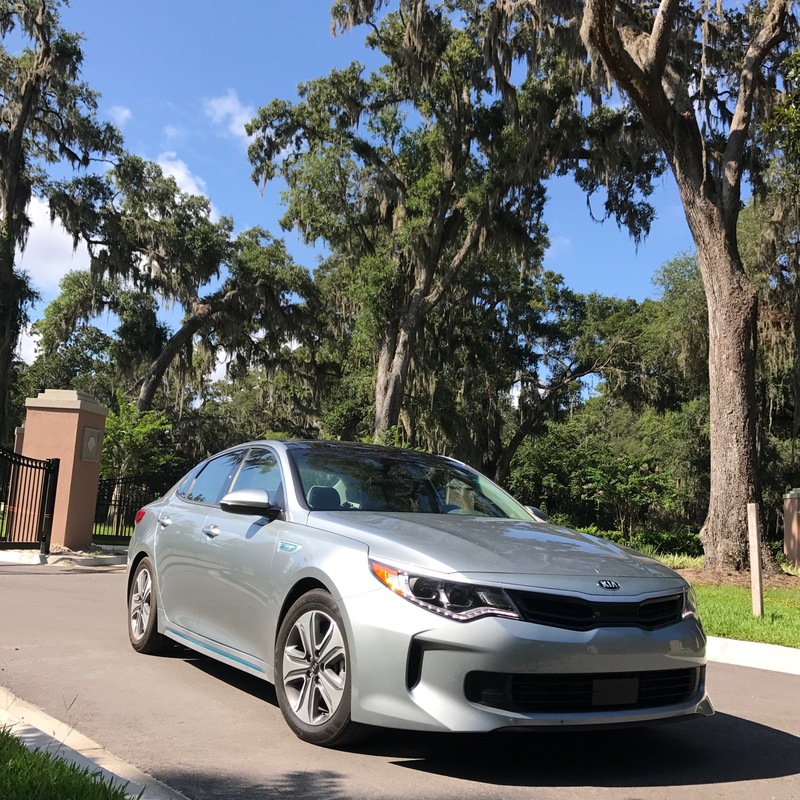 The Kia Optima is two feet shorter than Gomek, who once served as the star attraction at St. Augustine Alligator Farm Zoological Park. The Farm is just one of our Seven Fun Things To Do in St. Augustine, Florida.